Few animals have captured the imagination like brown bears. They are a high priority in conservation - given their dependence on large natural areas, brown bears are important management indicators for a number of other wildlife species. This species is one of the largest living carnivores. On average, adult males are 8 to 10% larger than females but sizes vary according to the location of the species. Brown bears usually forage in the morning and evening and rest under dense vegetation during the day. Depending on the season, brown bears may travel hundreds of kilometers during the autumn to locate food supplies. Hibernation lasts from around October/December to March/May. In certain southern areas however, hibernation is very short or may not occur at all. To hibernate, bears choose a location such as a burrow, located on a sheltered slope under a large stone or among the roots of a large tree. Dens may be used on repeated occasions over the years. Brown bears can grow to a huge size, males up to 350kg, females to 200kg. The biggest brown bear was caught in Romania and weighed 480kg. Although the pelage of this species is usually dark brown, it can vary from cream to almost black depending on the location of the species. In the Rocky Mountains (USA), they have long hairs on the shoulders and back which are frosted with white. Brown bears can be found in many habitats, from the fringes of deserts to high mountain forests and ice fields. In Europe, the brown bear is mostly found in mountain woodlands, in Siberia it occurs primarily in forests while in North America they prefer tundra, alpine meadows and coastlines. The species' main requirements are areas with dense cover in which they can shelter by day. Young born bears are vulnerable, being blind, naked and weighing only 340-680g. Cubs grow quickly, reaching 25kg by 6 months, and continue lactating for 18 to 30 months while eating a variety of foods. Cubs usually remain with the mother until the third or fourth year of their life. Although they mature sexually between 4-6 years of age, the species continues to grow until 10-11 years old. In the wild, the brown bears can reach 20 to 30 years of age. Despite this long life expectancy, most brown bears die very early. Brown bears mate from May to July, and a gestation of 180 to 266 days follows, with births occurring from January to March, usually while the female is still in hibernation. She generally lays down two to three offspring, and breeds again 2 to 4 years later. Brown bears are omnivorous, and their diet varies with the season - from grass and shoots in the spring to berries and apples in the summer, nuts and plums in autumn. All year round they eat roots, insects, mammals (including moose and elk in the Canadian Rockies), reptiles, and of course, honey. In Alaska, grizzlies feed on salmon during the summer. The total global population of brown bears is estimated to be above 200,000, Russia has the largest number of brown bears, believed to be over 100,000. 8,000 brown bears are thought to remain in western Europe and the Carpathians (Slovakia, Poland, Ukraine, Romania), and they are also thought to be found in Palestine, eastern Siberia and the Himalayan region, possibly the Atlas Mountains of northwest Africa, and Hokkaido (Japan). The species is still fairly common in the mountainous regions of western Canada and Alaska, where its population may reach 30,000 individuals. In other parts of the United States, fewer than 1,000 grizzly bears remain. 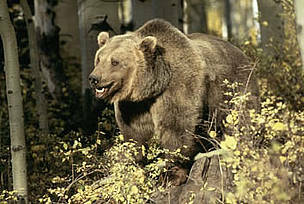 The brown bear was once distributed in northern and central Europe, Asia, the Atlas mountains of Morocco and Algeria (northern Africa), and western North America as far south as Mexico. Prior to the arrival of European settlers, it was found on the Great Plains of North America. The populations of the Sierra Nevada and southern Rockies have been extirpated, while those of Northern Mexico were lost in the 1960s. Grizzly numbers were estimated at 100,000 in the United States in the early 1900s. Brown bears were once subject to hunting and big game trophies, as well as being sought for their meat and hides. Bear gall bladders reportedly bring high prices on the Asian aphrodisiac market, but although demand is growing, there is no evidence that products derived from bear parts have medical value. Other serious threats to bears are habitat destruction and persecution, problems that affect populations to different extents across their range. For example, grizzly bears are now found only in 2% of their former range. Logging, mining, road construction and other developments have reduced available bear habitat and contributed to the decrease in bear populations. In some countries, human/bear conflict has caused problems, particularly in areas where bears can interefere with livestock, orchards, water supplies and garbage bins. The Great Bear Rainforest is home to rich wildlife that includes wolves, black-tailed deer, moose and grizzly bears. Spread the word! Click on the button to share this information with others via email or your favourite social networking service. The Kodiak brown bear of Alaska, and the Kamchatka brown bear are the two largest sub-species of brown bear due to the their protein-rich diets of spawning salmon and other fresh fish. Brown bears are very strong and show remarkable endurance, reportedly being able to outrun a horse, and drag a dead elk up a hill.